I have had springers 30 years. At present I have a 4 year old neutered male who is a great boy and plays like a puppy. My concern: I live on the largest fresh water lake in the world. The temperature hovers around 50-55 degrees in the summer. Last year there were several coveys of ducks and Jack would not come out of the water after almost an hour. He is so intent a hunter I fear he could get hypothermia or drown. Although he seemed in no distress it was scarry to say the least. Now I keep him on a long cable and of course no where as much fun as being free. What can I do? Thanks for your interesting question, and your kind comments. This is what I think you should do: If you don’t already use a dog whistle, get one. When Jack is in the water (or out) use the whistle – one blow at time, a few minutes apart. When he does eventually come out, use the whistle once again and give him a treat – a treat he doesn’t usually get. Over a few weeks you should be able to train him to associate the one blow with the treat, whether he is in the water or not. Don’t overdo it. Then as summer comes only use the whistle when he is in the water. If you already use a dog whistle, then you’ll need to train him to respond to a special pattern of blows – maybe short-long-short. That should sort him out. 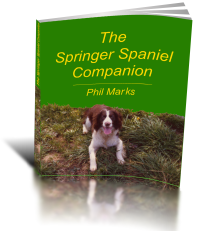 Springers just love the water, and one of mine lived to swim in the dock – a tidal dock. Late one evening he was heading out on the last of the tide with his best pal, my father’s Irish Setter (Milligan). They eventually swam ashore and landed on a mudbank…fine, but very muddy! I’ve learned to put much more effort into training since that evening.